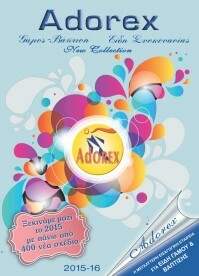 Adorex is one of the most important importing company of wedding, baptism and other occasional gifts in Greece. Equipped with over 30 years of experience in the manufacturing of such items, we started visiting other countries seeking to "discover" suitable gift items and favors which would have been in the spirit and the trends of the Hellenic and the European market. Your ever increasing sales orders confirm that the choices we have made in the selection of those items reflect on what the consumer desires. The new catalogue, Adorex Collection 2018, which you can see in our website, demonstrate the ultimate collection of gifts and favors for this year. All have been selected after a very careful consideration of hundreds and hundreds of items. Further, as it is already known, ADOREX offers its products at reasonable, competitive prices taking always in consideration the market conditions and the satisfaction of you, the buyer and your client's, the final consumer. We are ready, willing and able to serve you expeditiously with quality, intergrity and reliability. 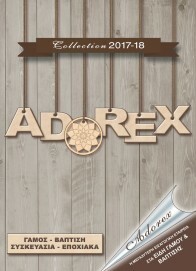 Our new catalogue Adorex Collection 2018 is available in our website..
Our new catalogue Adorex Collection 2017 is available in our website..
Our new catalogue Adorex Collection 2016 is available in our website..
Our new catalogue Adorex Collection 2015 is available in our website..
Adorex Import & Wholesale Company participates 2 Greek Trade Fairs 1. Fair "Mostra Rota and Gift Show" 17-20 January 2015 in Metropolitan Expo, Hall 3 - Booth Z14. 2. Fair " 49th Brideline Fair" January 31th - Februard 2nd 2015 at MEC PAIANIAS, booth No - 1 -. 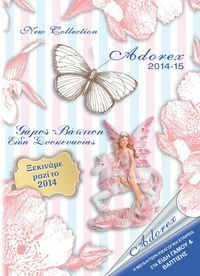 Our new catalogue Adorex Christmas Collection 2014 is available in our website. 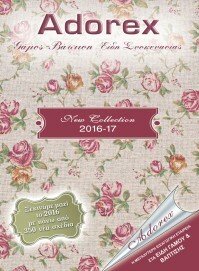 Our new catalogue Adorex Collection 2014 is available in our website. 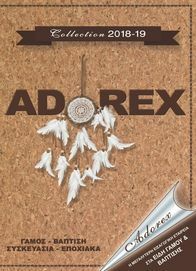 Adorex participates 2 Greek Trades Fairs 1. Fair "Mostra Rota and Gift Show" 24-27 January 2014 in Metropolitan Expo, Hall 3 - Booth Z10. 2. Fair " 49th Brideline Fair" 01-03 February 2014 at MEC PAIANIAS, booth No - 1 -.